Weary of the life as a lumberjack, you decide to leave the safe walls of your homeland in order to travel far away and begin the life of an adventurer. Months later, just as you start to doubt your decision, you arrive on an archipelago where you hear about something called "The Warhorn": A relic capable of granting immortality! You decide to settle on one of the islands - where your story shall begin. 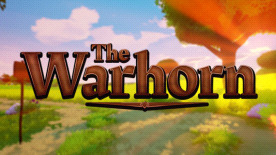 The Warhorn is a take on the unique mixture of genres, the most important ones being RPG and city-building/management while other distinctive elements in the game come from the exploration, puzzle and open world genres. Explore a vast open world: Including 5 themed biomes like spring / summer, autumn, winter, desert and jungle having their own unique sub-biomes with their own unique resources and denizens. Solve challenging puzzles: While most of them can be done alone, some might need a helping hand - or two. Face various foes: Every biome comes with its own set of animals, beasts and other denizens. Some of them may be neutral, but others could be deadly. Learn new skills: Wield a sword, swing a hammer or laugh at brute force and master the elements like fire, ice and light. Villagers can teach you many things, but in order for them to share their knowledge, you might have to earn their trust first... or a sizeable amount of riches. Build your empire: Learn how to build with different materials and create a village to your liking. Villagers will gather resources for you while your villages' soldiers are protecting your empire. Be ready for war: Build powerful war machines to either defend your village or attack another in a fight for resources, relics and secrets of this world. Multiplayer: Everything in the game can be done together. Build the most incredible empire with your friends, trade with other empires or fight against them.